It really takes a lot of guts to shun aside your preliminary recognition and step up to something totally new and surprising- not to forget shocking. This is one of the latest Celebrity trends where the league of style change has been something really common and fascinating for the masses and media to witness. In hairstyling and hues have taken a precipitous turn towards going totally bold by not only chopping off long tresses but also opting for invigorating fiery hair shades that has given the stars a new identity to carry. It’s really something interesting to witness how edgy style choices have geared into popularity the trend of unorthodox practices never practiced before. Transformed celebrity changes are initially hard to digest but when something triggers in media and celebrity trends, it really gets going due to the rise of the challenging environment. One by one a star tends to leap out and become the new addition to the list of the league of style change by mustering up the courage to take up new looks of fashion and style that defy his/her originality and hard earned fame. One of the pioneers of the craze for cropped styles, Miley was one of the first stars to jump into the world risk by chopping off her luscious long wavy hair for a undercut brushed up style accompanied by a fiery lipstick. Stunning the masses and her fiancé Liam, she confidently carried her latest celebrity trends torch and geared into vogue some bold looks which amidst the current wave of bold fashion simply make her shine out. The Twilight darling , Bella Swan is one of the latest celebrity risk-taker to give a shock to the masses by sacrificing her romantic cloud of wavy hair, which was an iconic look deemed as one of the hottest looks in hairstyling. 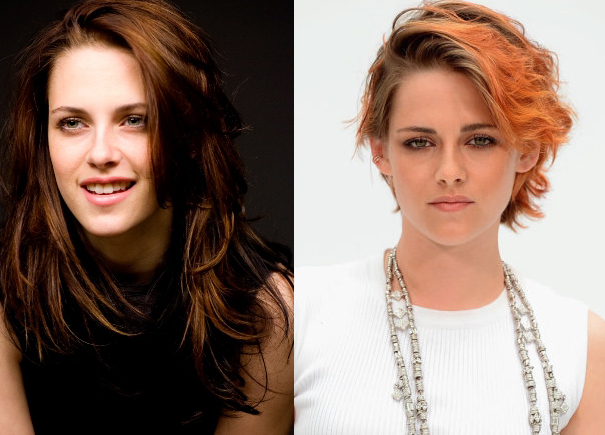 She has sprung in media with a shaggy short/medium cut with the fiery orange/rust hue for a new rock star peppy young teenager look by shunning away the renowned and acknowledged ‘Kristen Stewart Hairstyles’. Her classy metallic accessorizing simply adorns her new makeover and earns her thumbs up for her daring approach in honing out a new hot style for herself. It’s only a matter of time to see how much fan following she will earn after this mega transformation from a long wavy brunette to a rusty cropped funky girl. 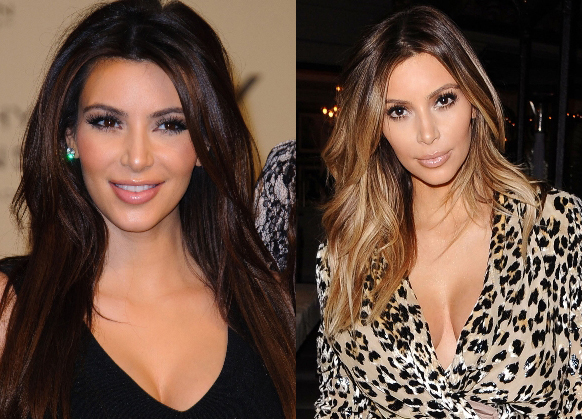 This is the name of the reigning star who has invested a great deal in the latest trend setting of celebrity trends, Kim Kardashian also recently shun aside her simple and sleek and innocent black beauty style to a more flaring blonde –mother. Her post -natal style change made great hue and cry in media and her new blonde style was Initially not what we had been expecting but this is what the latest celebrity trends are about- a complete shock to make it rock. Giving herself the dyed look has given a new meaning to her personality with a vigorous change of method in her hairstyles.